What is any good holiday season without some sort of gingerbread? Am I right, or am I right? I am right. The smell alone smacks a smile on my face. Spicy and sweet and all sorts of comforting. If smells could be objects, the smell of gingerbread would be a warm soft blanket that you can curl up next to a fire, with hot beverages and a good book. Yup, that is exactly what gingerbread smells like. Gingerbread cookies were an option for all the gingerbread goodness but right now there is a heavy influx of people making cookies of the gingerbread variety so I figured I should do something a little different and honestly, a heck of a lot easier and faster. Plus scones are a way more expectable breakfast food then cookies (who am I kidding, cookies are a completely expectable for breakfast) and I was looking for a good breakfast treat to feed the mr this week because its his birthday week and I wanted a little something special for him for breakfast. I know, I am just so great. 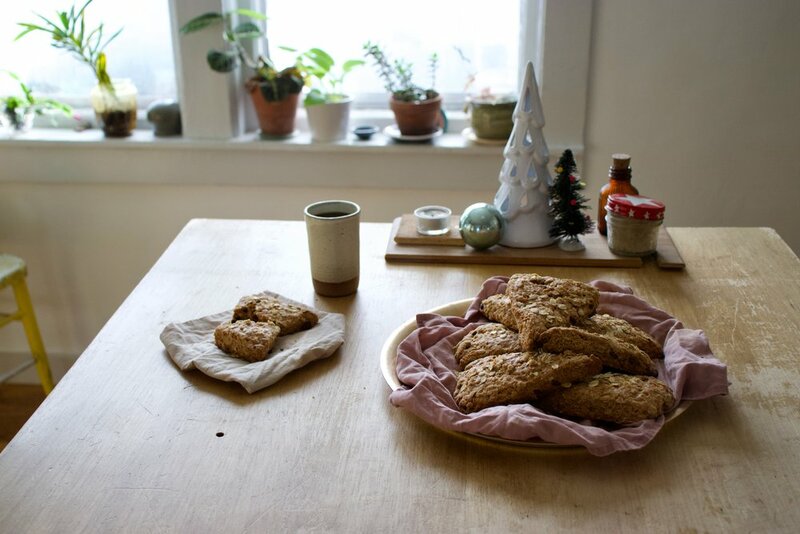 Anyway, these scones fit the holiday gingerbread bill. I mixed them up, added the chocolate chips for a little extra something, then tossed them into the oven and bathed in the smell as they were baking. Pulled them from the oven, poured some coffee, and set out a delightful afternoon snack for the mr, right after he was finished laying on the freezing ground trying to fix the tire on the truck. I think he really appreciated the smell of a warm blanket. And he really enjoyed the scones too. All birthday week long. So what are you doing this weekend? I think probably making scones. Yeah, do that. The stuff. 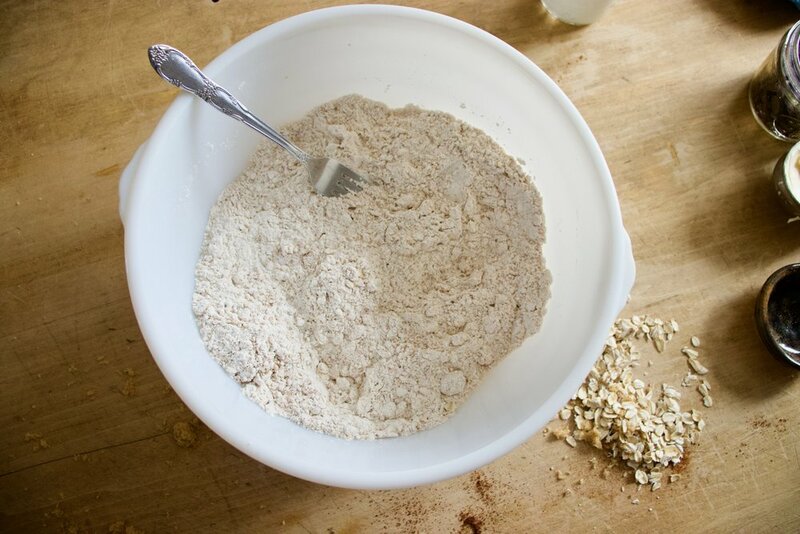 In the bowl there is flour, old fashion oats, baking soda and baking powder, and salt. Also need the spices of ginger, cinnamon, clove, and black pepper. Molasses, brown sugar, vegan butter, soy milk, and chocolate chips finish of the list. In the bowl add in all the spices and the brownl sugar. Mix until completely combined and there are no brown sugar lumps. Drop in the cold butter and cut it in with a fork. You don’t want it blended, you want the butter in little bits. You want it to look like this. Crumbly. Toss in the chocolate chip. Dump the molasses into the milk and mix until combined. Doing this helps minimize the amount of mixing you do which will help make sure your scones are not tuff. So don’t not do this. With a fork, lightly fold and mix batter until it just starts to come together. Dump dough out onto a lightly flour surface and gather together with your hands. Flatten into a big disk and cut into 8 equal wedges. Or as equal as you want to make them… you could even make a few more wedges if you want more. You do you. 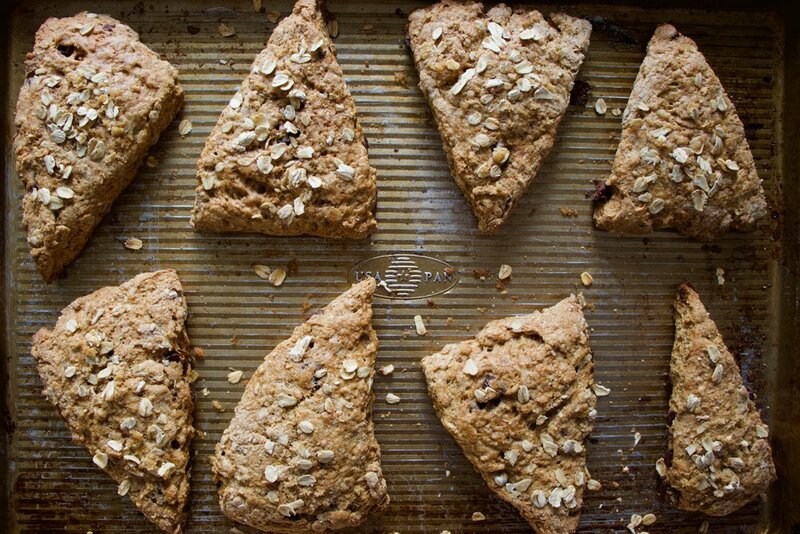 Place the scones onto a baking sheet. Brush a little milk on each then sprinkle the tops with a little brown sugar and some oats. Pop them into preheated oven and let bake. Gold brown and ready for the world. After letting them cool for a bit on a wire rack, stack onto a plate and feed them to your people. And yourself of course. Chocolate chip oatmeal gingerbread scone and a cup of coffee. A perfection in all the ways. Enjoy the weekend. It will be great, especially if you make some of these scones. In a large bowl, whisk together the flour, oats, baking powder and soda, salt, all the spices, and the brown sugar. Make sure there are no big lumps of brown sugar in the mixture. Once dry mixture is all mixed up, cut in (do not blend in) the cold vegan butter until the mixture looks crumbly. Toss in the chocolate chips. Grab your measure out milk and mix in the molasses until completely mixed together. 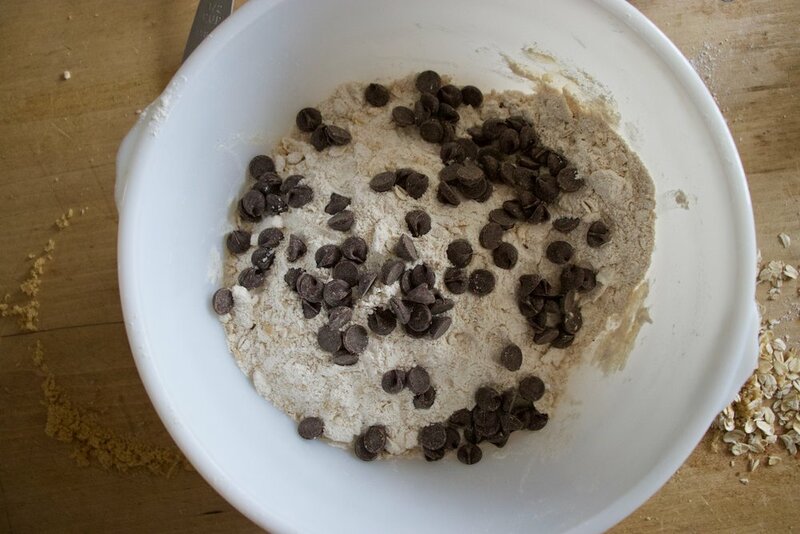 Dump the mixture into the bowl of dry and lightly mix with a fork until a dough forms. 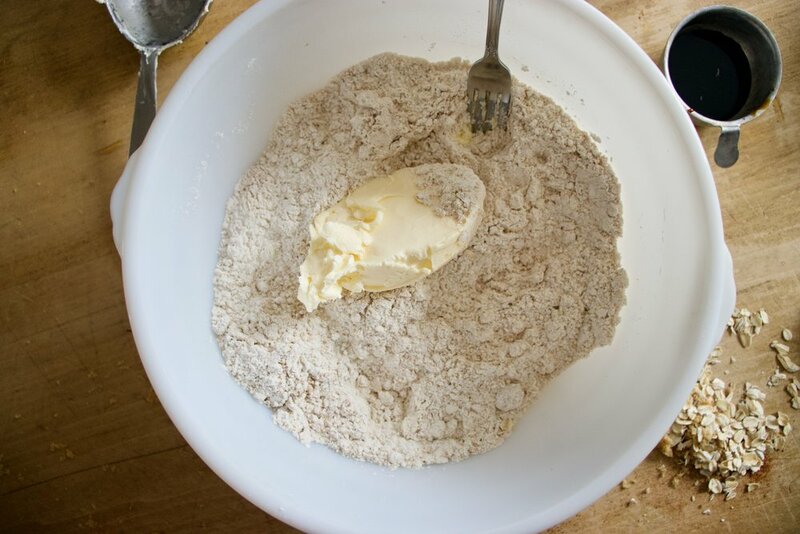 Dump out the dough onto a lightly floured surface and bring it all together with your hands .Flatten dough out into a circle about and inch thick them with a knife or dough scraper, cut into 8 even sized wedges. Place scones onto a baking sheet and lightly brush a little milk onto the tops.. 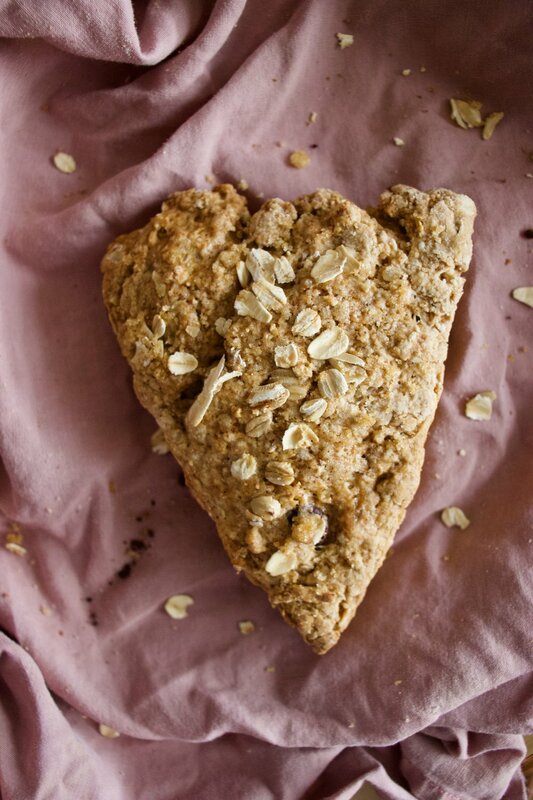 Mix together the extra oats and brown sugar and sprinkle on the tops. Place into preheated oven and bake for 25-28 minutes, or until nice and golden brown. Once baked, remove and place on a wire rack to cool. Eat. Store left over scones in an airtight container at room temperature for 3-4 days. Individual scones freeze well.